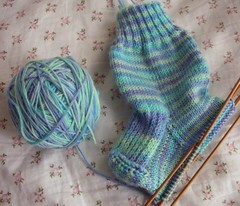 I've turned the heel and now I'm on the home stretch - just straight knitting until I get to the toes. I think I may actually finish a sock! I didn't make it very long, it's just four inches. My mom put up her tree the other day. It's very pretty, and very white! I was giving her a hard time about everything being so white in her house! I think it's pretty, but it's not my style - I like color. And here's a picture of the kid's christmas tree because Bradley really wanted colored lights!! I like your sock :). Boy, I guess your Mom likes white, everything in those pictures is white. Your tree is very pretty (and colorful)! Your mom's tree (and room) is very pretty, but I'm with Bradley, I like colored lights too! 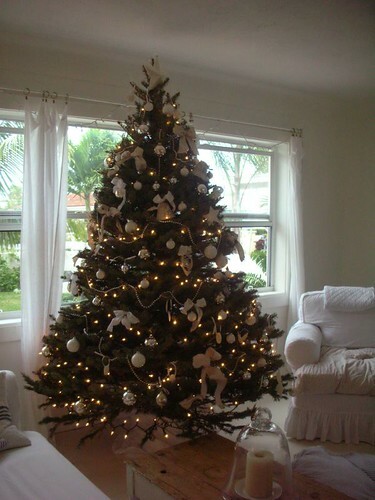 What a wonderful elegant room and tree your mum has - I really love it. Two beautiful trees! 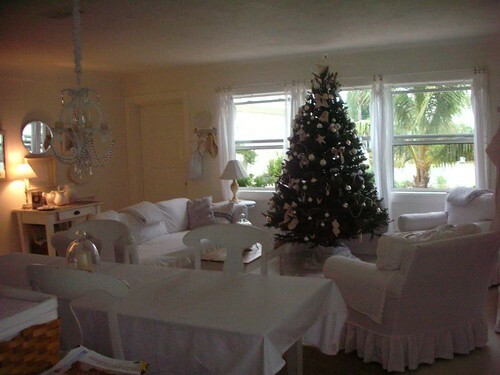 I love the all white room. I think it's a "my kids are grown" thing :) Happy holidays!